With this being our first edition after the very successful NAPBS conference I wanted to express my sincere appreciation to all of you that visited our exhibit booth. I also want to say a great big thank you to each of you that had your picture taken as a ‘Background Screening Shining Star.’ We had a lot of fun. 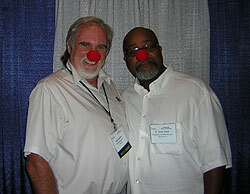 To show you how much fun, Mike Sankey, BRB Publications came to our booth with red clown noses and here was the result. Don’t laugh to hard. Also please email me at wbnixon@aol.com to let me know what you would like to see covered in the Buzz and ideas on ways we can help you create additional sales opportunities. Most new businesses are built without raising substantial amounts of outside capital. They are founded with small infusions of cash from the founders, perhaps augmented by support from relatives or wealthy individuals. In doing so, the founders avoid the effort and dilution of raising capital from institutional investors. The vast majority of small businesses remain small, and their founders are happy maintaining family control and pursuing modest growth. However, most business owners and management teams eventually reach a crossroads. Should they take on outside financing to fund future growth? Should the shareholders diversify their personal net worth by selling stock in their business to provide personal liquidity and enhance their financial security? If they do, will they have to give up the operating control that made their companies successful in the first place? These are very good questions to consider. Once the decision is made to seek outside capital, entrepreneurs and management teams can use equity and/or debt capital to achieve a variety of business objectives. Is Extensive Background Screening Creating an Unemployable Class? Hundreds of people rallied on Boston Common yesterday calling for reforms of criminal background checks. Reform advocates contend that some information on criminal backgrounds should be shielded to prevent discrimination against former offenders. ''Think about all the wrong and shameful things you've done over the course of 40 years," said Jackie Lageson of the Massachusetts Alliance to Reform CORI. ''Now imagine that every time you go for a job, you have to disclose it to everyone no matter how ashamed and sorry you feel. Opponents of changing CORI, such as the Massachusetts District Attorneys Association argue that employers have the right to know applicants' backgrounds to determine whether a potential worker poses a threat. In the drive to get working bodies into jobs, employers in some parts of the country and in some industries are turning their backs on drug testing. Is this a trend that will expand across the country and across industries, as the economy heats up and the competition for workers intensifies? And why is it happening? Some HR professionals and testing experts claim that drug testing is dropping off in part because it shows no demonstrable return on investment, at least in some industries. But others say that because the tight job market forces employers to be pickier about new hires, companies that forego drug tests are asking for trouble. Doing away with testing “does seem to be a trend,” said Mike Perkins, vice president and general counsel at Amstaff Human Resources in Pensacola, Fla. “My company is a PEO [professional employer organization], and, when we’re trying to find clients, more and more companies are uninterested in drug testing. On the Gulf Coast of Florida, with the hurricane reconstruction, there’s a huge demand for workers. Also in the hospitality industry,” said Perkins. “We’ve perceived it for some time. As the demand increases, drug testing is viewed as an impediment to finding employees. What is superior customer service? The simple answer is that customer service resides in your customer’s expectations. Remember not all customers are the same. If one is happy with a 10-day turnaround on a background check and you are doing it in 5, then you have met that requirement. If another wants 2-day turnaround and you take 5, that’s a lack of service. While TAT is a simple measurement that you must calculate and must review as management, customer service extends much beyond that. Every customer is different. When I ask a background checking company why they are better, invariably they give credit to “better customer service.” Is your definition the same as your customer? You might want to find out. Congratulations to Tracy and her team for a great job on making the conference a great success. They keep getting better and better. Also a big thanks to Mary Poquette and Jason Morris for their leadership this past year. An Ezine is A Simple Way To Increase Your Sales? You have heard about ezines and their power to boost sales, but were not quite how they would help your business or how to get started. To help you get your ezine going we have created an easy way for you to get started so you can unleash the power that is lying dominant in your business to skyrocket your sales. Here are Six Powerful Reasons Why You Need an Ezine! Proven method to increase sales. You can skyrocket sales of your services and products, online and offline. When your clients read about you in print it establishes you as ‘the expert in your field.’ Stay ahead of your competitors by establish yourself and your team as the experts. Keep your products and services fresh in your clients minds by keeping in touch. When they have a need you will be the first company to come to mind because you kept your message in front of them. Explain your services and products to increase clients awareness of how to gain maximum benefit from your services which will increase their familiarity, usage and even shorten your sales cycle. You have heard of Viral Marketing well let your ezine be the catalyst for stimulating your sales and business growth in a way that has been proven successful. Enhance revenue streams by selling more of your services and products to your clients and further penetrating client opportunities. We can simplify the process of creating and delivering an ezine for your company by providing you with specific content relevant to the background screening industry. 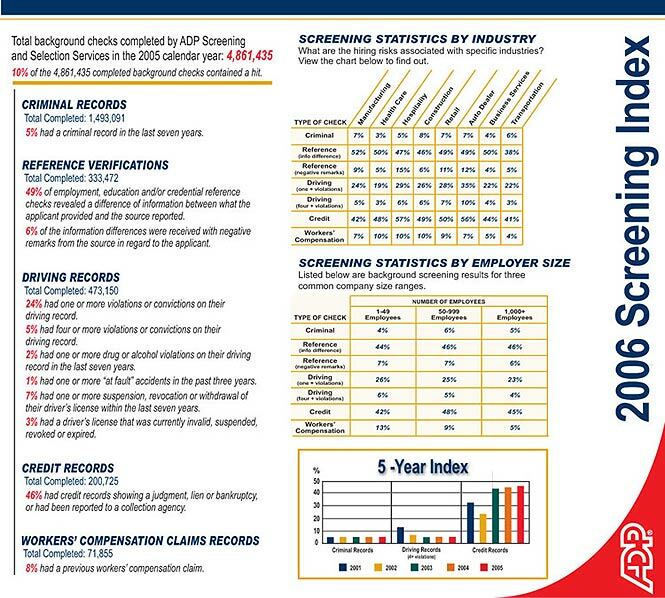 We have already done the work, the research and are knowledgeable about the background screening industry. You can share the valuable information from The Background Buzz that you have come to appreciate directly with your clients (minus the ads and competitive information and with your own personalized title/header) to build your relationship with them, to build their confidence in you as a resource and to cross sell your products and services. The California Investigative Consumer Reporting Agencies Act governs the disclosure of employer-conducted background checks. It requires an employer who collects information that's a matter of public record—such as documentation of an arrest, indictment, conviction, civil judicial action, tax lien, or outstanding judgment—to provide a copy of the record to the applicant or employee within seven days of receiving it. However, you can ask individuals to waive their right to receive copies of such public records by checking a box on an employment application or another written form. If you decide to fire or not hire someone based on a public record, you have seven days to give the person a copy of the record, even if the person has waived the right to a copy. You must provide the record before you take the adverse action, unless you obtained the public record as part of a misconduct investigation—in which case you can withhold the information until your investigation is complete. The law doesn't specify how long you have after completing a misconduct investigation to furnish the employee with the records. But now a new California appeals court ruling says you must provide them in a "reasonable" amount of time. Special Introductory Pricing - receive a 10% discount when you go to http://www.hrtutor.com/en/purchase.aspx?fromid=9111 and enter the code NOVIOLENCE during checkout. We are pleased to be able to offer the same discount to your clients if you would like to share this training suite information with them. By Dave Malmstedt, CEO, Vincera, Inc. The House of Representatives recently passed a Data Breach and Security bill aimed at regulating the beleaguered consumer report industries after 2005 which is being referred to ‘as the year of the information breach.’ The governmental appears to be determine to implement HIPAA-type legislation for Consumer Reporting Agencies (CRA's), placing the legal responsibility for Personally Identifiable Information (PII) security squarely on the shoulders of information aggregators and providers. Under the new laws, even data obtained from public record sources will likely be required to be secured from illicit use, theft, and tampering during data transfer and storage. This article details what you can do by using available tools to implement appropriate controls to secure the integrity of the PII you must transmit and to minimize the risk to your business. - What Motivates the Internal Attacker? - What are some common attacks? - Where should you begin to address the problem? A complementary report to provide consumers with factual and practical information to help protect themselves against identity fraud, based on the most comprehensive annual study in the U.S. For a quiz and easy-to-read tips based on this report, visit www.idsafety.net. Go to http://www.javelinstrategy.com/IDSAFETYQUIZ.htm to take Identity Theft Survey to see how vulnerable you may be and to get a copy of the report. As many as 106,000 individuals associated with the University of Texas are at risk because their personal information, including social security numbers, may have been accessed despite the school’s commitment to remove this information from student records. In response to this recent incident, Integrated Screening Partners (ISP) is releasing a white paper entitled, “Is Your Information Safe with Your Screening Provider” to educate HR professionals about current employee screening security risks. Your logo will placed at the top of the page along with other Platinum member’s logos in the alphabetical and geographical (US or International) sections. Much to the horror of many Indian companies they are discovering a large number of their workforce has made its way in on the back of forged documents for experience and other qualifications. Some estimates say every third curriculum vitae, CV that is coming in, could be fake or forged. Many employees are now being sacked and at least two leading IT companies have filed criminal complaints. But the malice may run much deeper and corporates have reason to worry. On March 22, 2006, Wipro, one of the biggest Indian IT firms sacked 25 employees for falsifying information in their CVs and a day later, Wipro lodged police complaints against not just the employees, but also the placement agencies that were responsible for them being there in the first place. An internal investigation by Wipro revealed a nexus with employment agencies. They had helped the employees provide false certificates and letters of previous employment - 10 such recruitment agencies have been dragged to the cops and another 20 have been blacklisted by Wipro. With security and identity management high on the agenda of European businesses and governments looking to reduce risk and protect themselves against fraud, the new centre will offer executives the opportunity to see first hand the benefits of biometrics technology. For example, the centre will showcase such applications as fingerprintidentification tools that could be used to limit access to buildings and areas within office or a combination of technologies such as voice and iris recognition to control access to data storage facilities. Unisys customers will benefit from the ability to test the latest biometrics solutions whilst also having the opportunity to work directly with Unisys business and technology consultants to develop customised solutions that can meet their specific needs and evolve over time as technology progresses. The centre also will provide clients with the opportunity to discuss and debate issues with leading experts who will offer guidance and potential solutions. Our special CD-ROM was distributed in Nice, France at the ASIS International European Annual Conference this week. We will also be distributing it and exhibiting at the Business Forum’s International ‘s Employment Vetting Conference in Stockholm, Sweden on June 16, 2006. Denmark. We will be reprinting the CD-ROM for the June conference which will give you a great opportunity to have your company information put directly in the hands of decision makers in Europe and the international community. SPECIAL ALERT – We have added two more conferences where the CD-ROM will be distributed - Business Forum’s International ‘s Employment Vetting Conferences in New York and London. When you sign up for the International Directory on CD-ROM you will also get a 12 month Platinum listing in PreemploymentDirectory.com in the International Section with the full benefits of a Platinum member.